A4 Sheet Calendars, which fall under price band A. A4 envelopes are available with these calendars for 30p per envelope. All these designs can be customised with your company logo, name and contact information. Folding Desk Calendars, which fall under price band B. This style allows for the inclusion of your company logo, name and contact information. Card Calendars, which fall under price band B. Any ‘8F’ code landscape card can be used for a card calendar, or you can supply your own image! The card folds inside out to become a 2019 desk calendar. You can choose different styles for the dates inside your calendar and customise the inside with your company logo, name and contact information - including phone number, email and address. 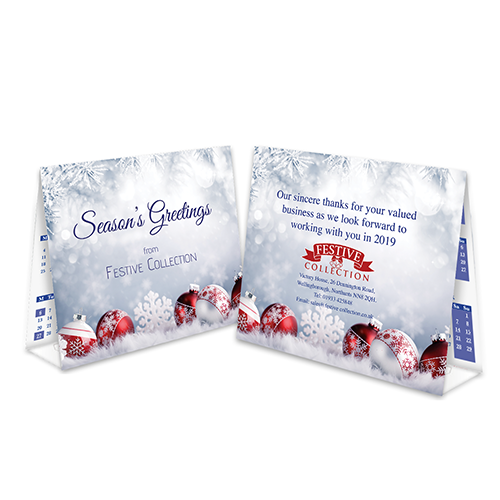 Both the Folding Desk Calendars and the Card Calendars come with free peel and seal envelopes. View our full range of Calendars here. You can request up to 6 free samples delivered in 3 working days to see the designs yourself.